CAIRO, (Reuters) – Egyptian President Hosni Mubarak refused last night to bow to demands that he resign after ordering troops and tanks into cities in an attempt to quell an explosion of street protests against his 30-year rule. Demonstrators were still out in the streets in the early hours of this morning, as were looters. 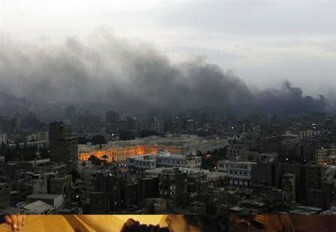 Parts of Cairo looked like a war zone, filled with smoke, rubble and the choking smell of tear gas. Mubarak dismissed his government and called for national dialogue to avert chaos after a day of battles between police and protesters angry over poverty and autocratic rule. Medical sources said at least 24 people had been killed and over a thousand injured in clashes in Cairo, Suez and Alexandria. “It is not by setting fire and by attacking private and public property that we achieve the aspirations of Egypt and its sons, but they will be achieved through dialogue, awareness and effort,” he said in a televised address, his first public appearance since the protests began four days ago. The unprecedented unrest has sent shock waves through the Middle East, where other autocratic rulers may face challenges, and unsettled global financial markets on Friday. U.S. President Barack Obama said he had spoken with Mubarak and urged “concrete steps that advance the rights of the Egyptian people”. 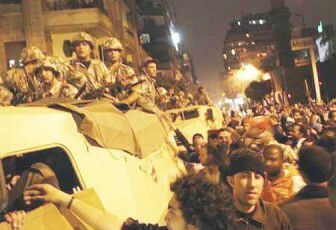 The army, deployed for the first time in the crisis, cleared Cairo’s Tahrir square towards midnight. 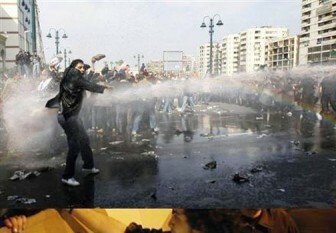 Shortly after Mubarak’s speech, protesters returned in their hundreds, defying a curfew. They said sacking the cabinet was far from enough. “It was never about the government, by God. It is you (Mubarak) who has to go! What you have done to the people is enough!” said one protester. Shots were heard in the evening near parliament and the headquarters of the ruling National Democratic Party was in flames, the blaze lighting up the night sky. Cars were set alight and police posts torched. A Reuters team saw a gang of looters storm into a bank and carry out the safe. More than half of the dead in yesterday’s clashes were reported in Suez, the eastern city which has been ground zero for the most violent protests over the past four days. Mubarak, 82, has been a close ally of Washington and beneficiary of U.S. aid for decades, justifying his autocratic rule in part by citing a danger of Islamist militancy. 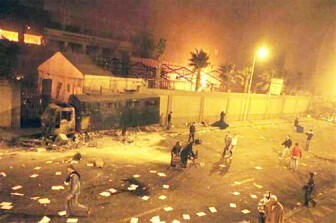 The Muslim Brotherhood opposition, however, appears to have played little role in the unrest. The protests were triggered by the overthrow two weeks ago of Tunisian President Zine al-Abidine Ben Al Ben Ali. Street protests in Tunis focused on similar issues of poverty and political repression. Demonstrations have also flared in Yemen, Algeria, Sudan and Jordan in recent weeks. “There will be new steps towards democracy and freedoms and new steps to face unemployment and increase the standard of living and services, and there will be new steps to help the poor and those with limited income,” Mubarak said. “There is a fine line between freedom and chaos and I lean towards freedom for the people in expressing their opinions as much as I hold on to the need to maintain Egypt’s safety and stability,” he added. Obama also called on the Egyptian government to halt interference in access to the Internet, mobile phone service and Internet social networks that have been used by protesters. “I want to be very clear in calling upon the Egyptian authorities to refrain from any violence against peaceful protesters,” he said. Anthony Skinner, Associate Director of political risk consultancy Maplecroft, said Mubarak’s conduct was reminiscent of that of Ben Ali in his final days in power. “Mubarak is showing he is still there for now and he is trying to deflect some of the force of the process away from himself by sacking the Cabinet. Markets were hit by the uncertainty. U.S. stocks suffered their biggest one-day loss in nearly six months, crude oil prices surged and the dollar and U.S. Treasury debt gained as investors looked to safe havens. “I think the next two to three weeks, the crisis in Egypt and potentially across the Middle East, might be an excuse for a big selloff of 5 to 10 percent,” said Keith Wirtz, president and chief investment officer at Fifth Third Asset Management in Cincinnati, Ohio. Many protesters are young men and women. Two thirds of Egypt’s 80 million people are below 30 and many have no jobs. About 40 percent of Egyptians live on less than $2 a day.